No weights or sliding pointers to worry about, just place the hook on the trigger and pull. The large, easy to read LCD quickly displays the results. Strain gauge technology provides accuracy to 1/10 of an ounce from 1 oz. to 5 pounds and to ½" oz. from 5 to 12 pounds. Lets you take up to ten readings and display the average. Displays either English or Metric format. SPECS: Plastic case. Steel hook, 5¾" (14.6cm) long. 11½" (29.2cm) overall. 1 oz (28.35 g) to 12 pds. (5.4 kg) range. Includes ballistic nylon storage case. This gauge is so easy to use its ridiculous. Its the best when it comes to really fine tuning a trigger and getting things EXACT. Tends to be very inconsistent unless measures are taken to control for any possible variable between data samples. Works best with a soft-jawed vice for holding the fire arm. The Lyman gauge is easy to use and takes the guess work out of adjusting triggers. I find that readings are easiest to take when the gun is secured, either in a gun-vise or wedged on/between sandbags. The gauge works better when the "L" of the rod faces away from the LCD display. Battery life is OK (takes a 9-volt) and the carrying case makes trasporting inside a range bag easy. I had the less expensive spring scale. I purchased this one three days later. I knew that my custom made guns had trigger pulls of 3.5 pounds and 4 pounds. The Electronic Trigger Pull Gauge was right on. The sring pull gauge was off buy over 1.5 pounds. This Electronic Trigger Pull Gauge is worth saving your money and getting a quality tool. If you tinker with trigger, this product is a must. If you plan on doing anything to a trigger you have to know where you started and where you end up as far as trigger weight. The Lyman is accurate and repeatable. If you think you can guess weights or feel changes in weight, guess again. I first bought the inexpensive RCBS gauge. It was terrible and was returned. This tool is easy to use and the readings are within a small variation from each sample. Try to secure the firearm and pull consistently in a straight line. The reading is captured and the tool will average up to 10 readings. Accuracy is +/- a tenth of an ounce under 5 lbs. and a half ounce to 12 lbs. If you work on triggers or want to evaluate a firearm this is a great tool. great tool, using it for military rifle and a broad range of other rifles,shotguns and handguns. I have owned mine for a couple years. I gunsmith for a living so quality tools are a must. This is a bit of a gadget. The 12 pound capacity is great for double action pistols. It is very prone to over travel on the actual reading so the capture will read much higher than the actual break point if you are not careful. I find it easier to watch it climb ounce by ounce and visually catch when it trips as the highest reading capture will go over by varying amounts. With practice this really is an accurate scale. I check it frequently against my laboratory scales and it's always right there. Dropped it one time onto our 5/8 rubber shop floor and it is dead. Lyman said no warranty on dropping. I am okay with that. My fault. No precision instrument should ever be dropped. All that said, I find I can't live without it so I'm buying another. So, the Lyman weight gauge came in and I broke it out. As always I first tested it against several triggers with know pull weight we have installed. WOW what a shock! This equipment is either broke or just a bad product! I used it on 1 pistol with a 4 lb trigger pull, (tested before). It looks different than the one pictured so maybe I was sent a different product than above reviews. After 20 minutes of using on this 1 pistol & never the same reading, I was pretty upset. This gauge went from 0.1 oz - 15.0 lbs? It never displayed the 4 lb trigger! Purchased this to replace a spring unit that was giving wildly variable readings. Have an NRA weight set, but only use those or match rifles. Too time consuming for everyday use.Fresh out of the box I used the Lyman to set up three rifles that were otherwise ready to go out the door. Pull, adjust, pull, adjust, pull, pull, pull, pull, average, and you're done. This is not a brute instrument. Treat it gently, though, and it works just fine. I've used this for several years and have always been frustrated by the lack or repeatability. I recently acquired a set of 4.5 lb NRA match weights so I decided to 'pick them up' a few times as a test. The results (converted to fractions of a pound) were 5.12, 4.12, 3.93, 3.38, 4.45, 5.44 and 4.25 lbs. The true weight is 4.5 lbs and these readings were taken with the steel weights hanging from the Lyman - no over-travel issues as described by other reviewers. I guess there is a reason Lyman includes an averaging feature on this device. 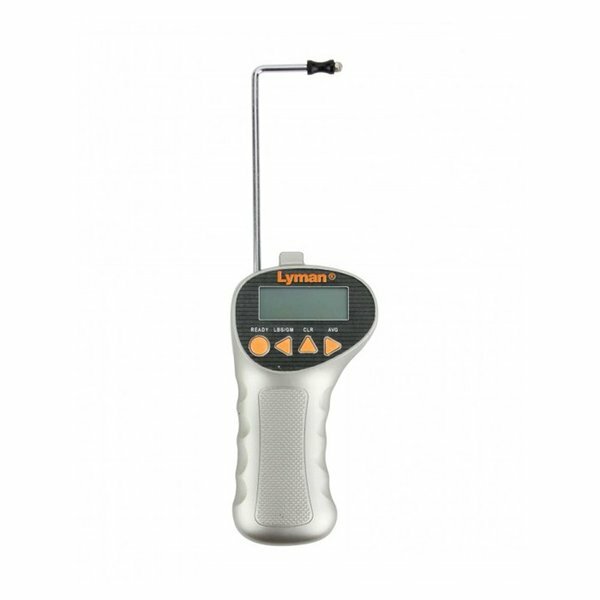 The Lyman Electronic Trigger Gauge is a durable piece of equipment for doing "average" work. If you need precise repeatable weight, use the competition steel weight method. I've used this gauge since 2013 on countless guns that have come through both the gunsmithing school I went to, and now the pawn shop I work in, and the device is still accurate, if that doesn't scream reliability I don't know what does. The ability to accurately measure trigger pull in ounces and ounce fractions, coupled with averaging over up to 10 pulls makes this gauge worth the extra money compared to traditional spring gauges. If you are accurizing triggers this is the right tool for the job. This gauge is easy to use, easy to read and breaks down to store in most drawers or tool boxes. I build 1911's and getting a good trigger pull usually takes a lot of trial and adjustment cycles. I used a spring gauge initially but found them inaccurate as a rule. This gauge has the added capability of averaging a series of readings to even out your technique. But, the key to using this gauge is to make sure the pistol is secured in a vise or something to keep it from moving. Make sure each trial is exactly the same as the previous (same angle, placement of the roller, and rate of pull) If you don't, the readings will vary too widely. Double action pulls are harder to get accurately and there is a max pull it will not go beyond. Tillverkarens produktnummer: 7832248 011516522481 Inga vikter eller glidande pekare till oroa sig, placera bara kroken på avtryckaren och dra. De stora, lättlästa LCD snabbt visar resultaten. Anstränga mätinstrumentet teknik ger noggrannhet 1/10 av ett uns från 1 oz. 5 pounds och ½" oz. från 5 till 12 pounds. Kan du ta upp till tio behandlingar och visar genomsnittligt. Visar antingen engelska eller metriska format.